How long does soil take to form? | Soils Matter, Get the Scoop! How long does soil take to form? Q: I recently came across a fact that said, “It takes more than 500 years to form an inch of topsoil.” Could you tell me more about this? What’s the actual process through which soil is made? What part of the process takes so long? And if it takes so long to form, why is topsoil so readily available? A: We say that it takes 500 to thousands of years to create an inch of topsoil. The reason is that soil is often derived from rock. The rock has to be broken into small pieces first. This happens by physical weathering: things like freezing and thawing in colder climates, and chemical weathering in warmer climates. Once cracks form in the rock and plants can take hold, the plants continue to break the rock into smaller pieces by root action and start to add organic matter. Chemical weathering also continues, turning the rock pieces into the sand, silt, and clay particles that make up our soil. Formally, we think of soil as being formed by five factors: 1) Parent material…or the type of rock or unconsolidated material we start with; 2) Vegetation…the action of roots and the addition of organic matter; 3) climate…which controls physical and chemical weathering processes; 4) Topography…which controls the stability of the soil in the landscape; and lastly 5) TIME…as mentioned above. So it can take an incredible amount of time to form topsoil. Luckily, two things in our favor allow us to have a lot of topsoil in the United States. First, not all soil forms from solid rock. The glaciers of the north crushed the parent material and did much of the physical weathering for us. Many soils formed after glaciers retreated are only about 10,000 to 20,000 years old, but have thick topsoils. Other soils formed in materials that were already physically weathered and deposited by moving water or wind, allowing topsoil to form much faster. Second, outside of glaciated areas we have had a very long time to form soil. In the panhandle of Florida, for example, the landscape has been exposed to continuous weathering for close to 1 million years. So while it takes a great deal of time to form topsoil, we have had that time. For more about soil formation, read our more recent blog called When does rock become soil? i like learning about the differant king of soil. What about plant litter? Doesn’t that turn into soil as it decomposes on the floor of a forest? Thanks, Karl! Great question. 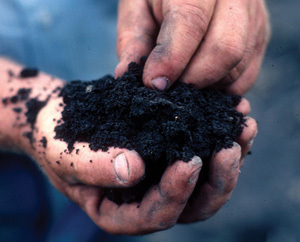 The answer is yes, microbes break down plant material into organic matter that can eventually become part of the soil. This is a great idea for a blog post, and we’ll put it on our list! Thanks for reading! Thanks, Damia! Soils are VERY interesting. They sustain life, they are dynamic…so much to learn about soils! Also soils form very quickly on the (rapid) deposits of volcanic ashes. These soils are some of the most productive in the world, when the downstream river and lake deposits of volcanic ash soils are included. These soils can be productive within as few as five years: see the island of Surtsey, and the soils formed after the eruption of Mt St Helens, USA. so how did the moai stone heads and bodies on easter island get burried by 20 feet of earth rock and soil in inly 700 years? How long does it take for the organic material to be introduced into the sediments?